At first glance, the photographs currently on display in the Headwaters Art Gallery at the Alton Mill Arts Centre have a distinct feeling of distance. The viewer may see isolation in the mystical black and white prints that adorn the walls of the Gallery. 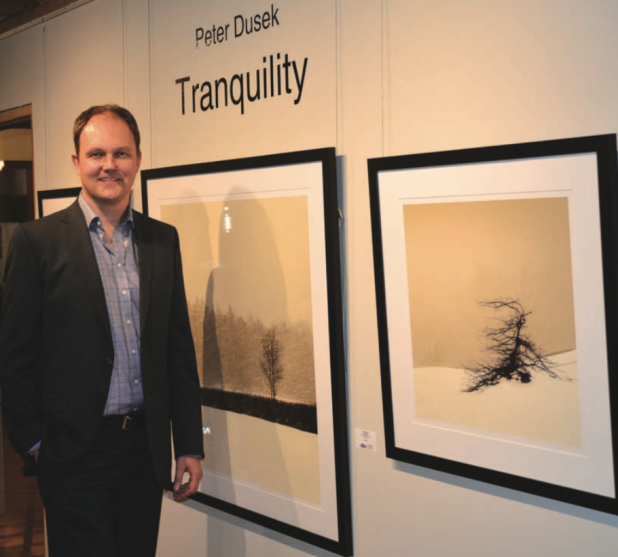 When you put them all together, you can follow the vision created by award winning photographer Peter Dusek in this exhibit. “The eyes and the soul are assaulted by a myriad of things, causing us to lose our focus, become scattered, and even blinded to the simple beauty hidden around us,” states Mr. Dusek’s biography and explanation of his current work. A relative newcomer to the world of photography, Mr. Dusek is by vocation a computer consultant and programmer. You wouldn’t usually associate computers and photography, but with the medium now almost entire digitally driven, Mr. Dusek said the learning curve was very easy for him. “In modern times cameras are all digital so all my skills on the technical side I have been able to transfer. Anything to do with computers has always been easy for me. I don’t know where the arts side of it comes from. He is inspired by the rural and scenic area surrounding his Hockley Valley home and has spent considerable time touring the area on his motorcycle. The images in the exhibit were all created within a short drive of his home. During an exhibition in Toronto, his work was noticed by high-end retailer Saks Fifth Avenue. The company bought the entire exhibit and ordered double prints to display in their Toronto area stores to represent Canadian art. The show at the Headwaters Arts Gallery is titled, Tranquility, and will be on exhibit through to November 13.